A guest post by Jane from www.shoestringcottage.com. Jane writes articles on frugality and helping people control of your finances, pay off your debts and save for the future. Have you ever wished you could make a bit of extra money but just don’t have enough hours in the day? If you have a spare room in your house, even if it is only some of the time, you can use it to create extra income with minimal effort. Here is the low down on how to make money from your spare room. I have tried all of these. The extra money we make from using our spare room in this way helps to pay for the extras that make life fun, like days out and holidays. You need to be pretty easy going and happy to have other people about to have a permanent lodger. Remember, you will be sharing the kitchen, bathroom and potentially your sitting room with them. I wouldn’t have done this when my children were small, but now they are all grown up and only at home some of the time we enjoy having someone else in the house. We are fortunate to have a small downstairs dining room and have turned this into a sitting room for the lodger. This means we can relax in our own lounge without fighting the lodger for the remote! If you have a large, double room to rent you could put a TV in it so that you can retain your privacy. I have found that my lodgers have all tended to watch TV on their laptops in bed anyway! We are on our third lodger and found them all via spareroom.com. It is very easy to use and you can place an advert for free. I have chosen to place a paid advert the last couple of times as you appear at the top and prospective lodgers will find you more quickly. If you have a university, further education college or hospital nearby you can find potential lodgers by asking if you can put an advert on their noticeboards too. You can specify the type of lodger you would prefer. We always have women. When we first advertised for a lodger my youngest daughter was only 16 and still at home. She didn’t feel comfortable at the idea of sharing the house with a strange man! They also need to like cats and we make it clear we have two in the advert. Price your room realistically. Do some research first to see what similar rooms in your area go for. We always show our lodgers around and get them to sit and have a cup of tea with us so that we can get a feeling about whether we will get on with each other. Having said that, Jess, our second lodger was away studying so our ‘meeting’ was via Skype! I showed her around the house and we had a little chat. I had a feeling we would get on and we really did. I was so sad when she finished her masters and moved on! Your lodger can become part of the family. You can also ask for references, although all three of ours had never rented before so didn’t have them. I think you need to go with your gut feeling. I use the lodger agreement from spareroom.com, which is less than a tenner. Once you have purchased it you can use it forever. It lays out exactly what the terms are, such as how much notice you need to give on either side, what the rent is, how much deposit has been paid, etc. Get one month’s rent in advance plus a damage deposit. There is lots of good advice about renting a room in your house on gov.uk and on the spareroom.com website. This is how to make money from your spare room if you don’t want a full-time lodger. When mine were small and money was tight, I even moved one of my daughters in with her sister for a couple of weeks and a student went into her room. They didn’t mind as it earned us some money for a holiday! Check online to see if you have any language schools in your area. We are fortunate to have one a couple of miles away and have had many short-term students from all over the world. It is so interesting to meet them and learn about their culture, whilst helping them to improve their English. We also use an organisation called LEC, which bring groups of French secondary school students in for a week or two at the time and are always looking for good host families. With most organisations you are expected to provide breakfast and an evening meal. You should take meals with them and encourage them to practice their English. They will need a room of their own with a comfortable bed and a desk for homework. This is a fun way to make money from your spare room and kids really enjoy it. You can read more information on hosting foreign language students here. AirBnB is another way to make money from your spare room on a part time basis. If you live in a tourist area, you may find you are busy all the time, but even if your house is somewhere rather more humdrum than the seaside, in a city or near a national park you can still rent out a room from time to time. For example, my daughter and her boyfriend had a dramatic water leak in a rented flat recently and their landlord used AirBnB to find them temporary accommodation in the home of a single lady for a week. Business people on their travels may prefer a more homely environment than a cheap hotel. You need to impress to get good feedback. Your room should have a comfortable bed, storage, a bedside table and light as a minimum. You could also add a TV and tea/coffee making facilities. The room and any areas your guests might use need to be spotlessly clean. If you have more than one bathroom in the house, allocate one of these for your AirBnB guests. If you are sharing, check what time your guests need to use the bathroom and try to be in and out quickly beforehand. Be clear about whether you are going to offer breakfast or any other meals and, if so, what they will consist of. Be there to serve your guests if you are offering food. We had a bad experience in Wales one year. The host was there to greet us and seemed very nice. She gave us a key as we were going out to dinner, but we didn’t see her again. Some breakfast things had been left out the night before, with a note saying to help ourselves to bread, cereal, jam etc. Unfortunately, there was no milk or juice and, on looking in the fridge (which was beyond filthy) we found there was just one bottle of out of date, sour milk. We found some margarine and stuck to toast! The host asked me several times to leave her feedback after her visit. I chose to say nothing rather than leave her bad feed-back but did message her to say why. Again, do some research to see what others are charging for similar rooms in the area and set your price realistically. There is a really good post here from someone with a lot of experience of making money with AirB&B. 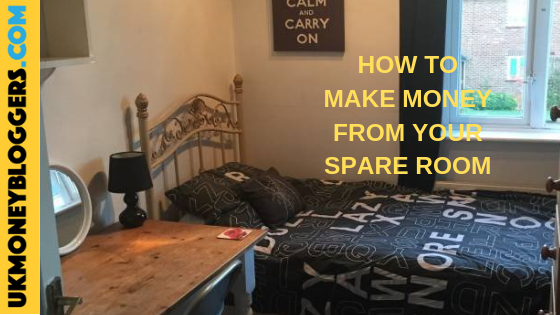 I hope you enjoyed this post and it has given you some ideas on how to make money from your spare room. Maybe you have some others?